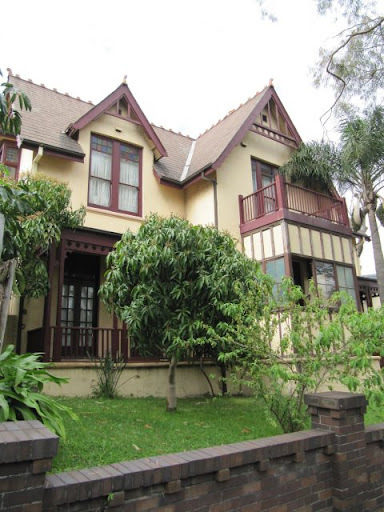 Venice, 66 Frenchmans Road, Randwick, NSW 2031, is a comparatively rare and distinctive example of late Victorian architecture retaining most of its period detailing intact. 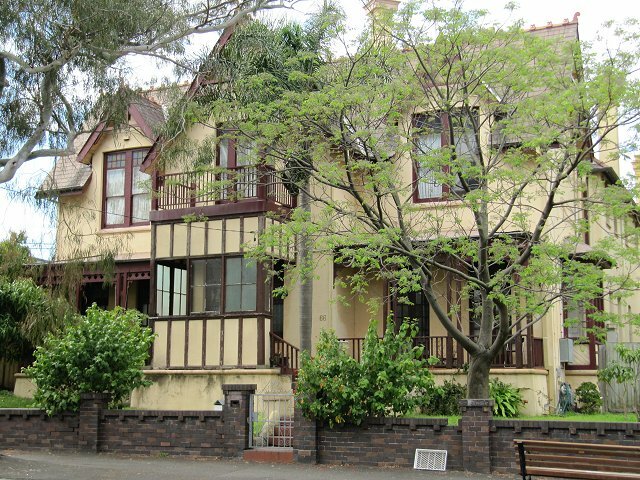 Venice is an impressive and substantial two storeyed Late Victorian gentleman’s residence designed in the early Federation or Gothic Revival style. The house contains a symmetrical front facade incorporating a central projecting entry bay flanked by gablets and one storey verandahs featuring elaborate timber fretwork. Highly individual design with both Gothic and Tudor influences evident. Symmetrical design with projecting gabled section in center. Existing area projects out further at ground floor with open balcony above. Walls rendered (presumably original) with ashlar coursing. 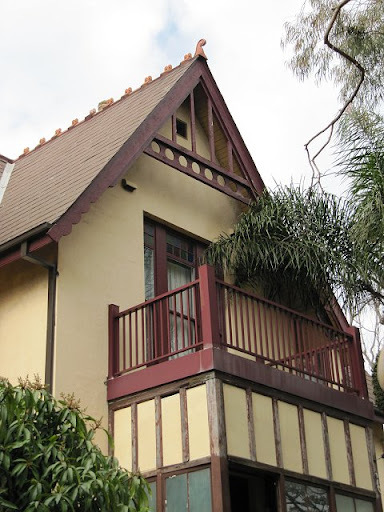 Most decoration in timber including Tudor style gables. Typically Edwardian details on verandah with fretwork valence and carved brackets. French doors appear to be later in style (1930’s) and feature attractive stained glass. Good timber decoration on gables. Coloured glass panes in upper sash windows. Moulded chimneys and step rails. Fence is about 1940. Attractive front area. 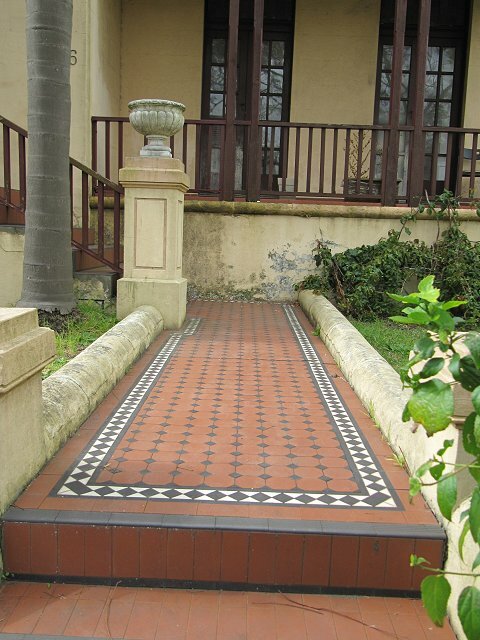 In 1979 Venice was purchased by Dr.H.M Kalmuth for a family home and restoration commenced in the 1980s. In plan the house is also symmetrical with a centrally placed hallway of generous proportions incorporating a grand staircase, behind which is located an intricately patterned stained glass window. The ground floor reception rooms are located either side of the hallway while to the rear right-hand side is sited the service wing. Period detailing is of a high standard throughout with diagonal chimneys, tessellated tiled path and hallway, leadlight front door, bay windows, timber wainscoting, fireplaces and elaborately moulded cornices, ceilings and roses. The resultant design is very distinctive and there is no similar house design within the Municipality of Randwick. The site on which Venice stands was originally part of a 30 acre 3rods and 9 perches Crown Grant to the Church of England and Ireland. In 1882 the Church began sub-dividing the land under the name of St Marks Glebe. A Sydney solicitor, Thomas James Dickson leased Lots 1 and 2 Section 1 for the term of 99 years. The rent was 13 pounds per annum and the lessee was expected to build a solid house on the land, maintain it, pay the rates and taxes. No noxious trades were allowed for example boiling down works, slaughter house or beer house. 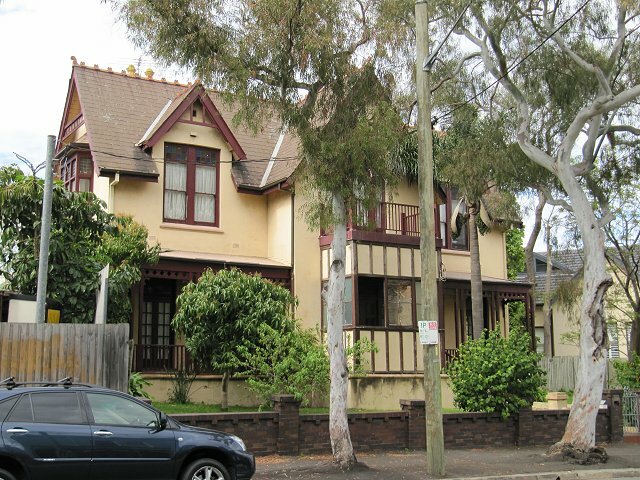 In 1884 Dickson sold the residue of his lease to Stephen Gee a builder of Sydney for the sum of 20 pounds. This amount indicates that some type of building would have been erected, most probably the stables. The Sydney Water Board map of 1891 shows water connections to all completed houses in this area of Randwick. An outline of Venice and two small buildings to the rear is shown. Also shown is a ‘fountain’ marked on the north side of Venice to which a water connection appears. The Sands Directory of 1893 contains the first listing of a resident for No.66 is a Mrs Nicholson and the next year a Mrs. Maquire for the next two years. It is interesting to note that the building does not appeared to have been lived in by Stephen Gee for more than six years. From 1897 to 1906 the name Venice appears in the Sands Directory with resident G.H. Holmes. It is possible that Holmes was a lessee during these 9 years. From 1909 to 1919 a number of different names are listed as residents for the ten years. 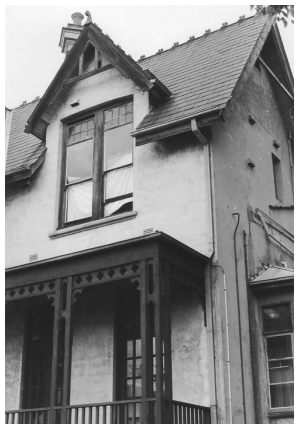 In 1979 Venice is purchased by Dr.H.M Kalmuth for a family home and restoration is commenced in the 1980s. 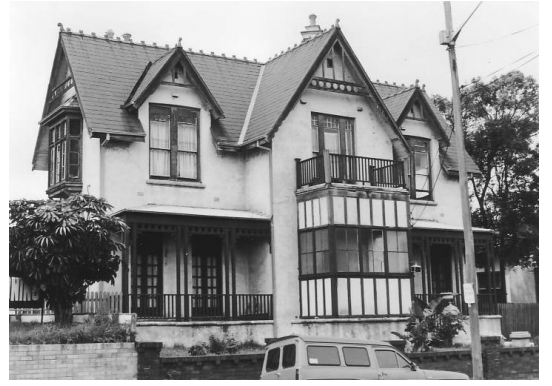 Following representations by the Randwick Historical Society expressing concern over the dilapidated condition of Venice an Interim Heritage Order was made over the property on 27 July 1979. At its meeting of 7 May 1981 the Heritage Council of NSW resolved to recommend that a Permanent Conservation Order should be made over the property. On 10 July 1981 the then Minister for Planning and Environment the Hon. Eric Bedford MP approved the making of a Permanent Conservation Order. An objection to the proposed Order was subsequently lodged and a Commission of Inquiry was set for 11 February 1982. Following further discussions, the objector withdrew their objection to the making of the Permanent Conservation Order. A Permanent Conservation Order was made over the property on 15 May 1982 and it was transferred to the State Heritage Register on 2 April 1999.